To kick off this week-long celebration of the dinosaur hunting warrior Turok, I figured the best place to start would be with the most recent installment or the series, 2008’s Tuork. 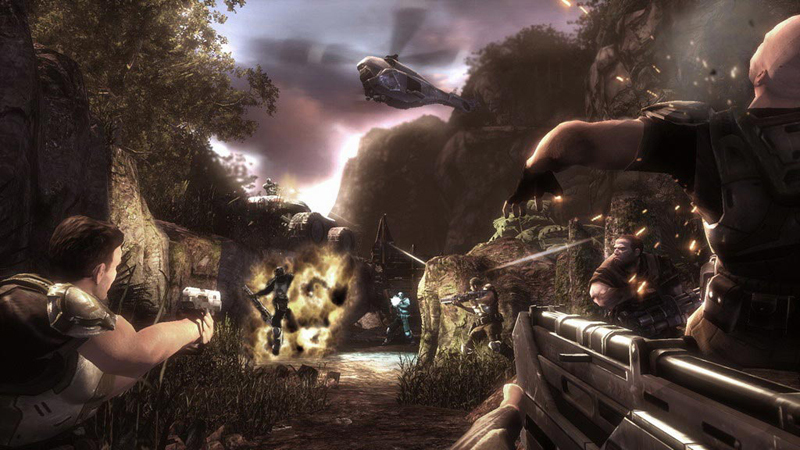 Turok is a 2008 reboot of the classic videogame/comic book series. Turok is no stranger to reboots, but this is probably the biggest departure from original story. 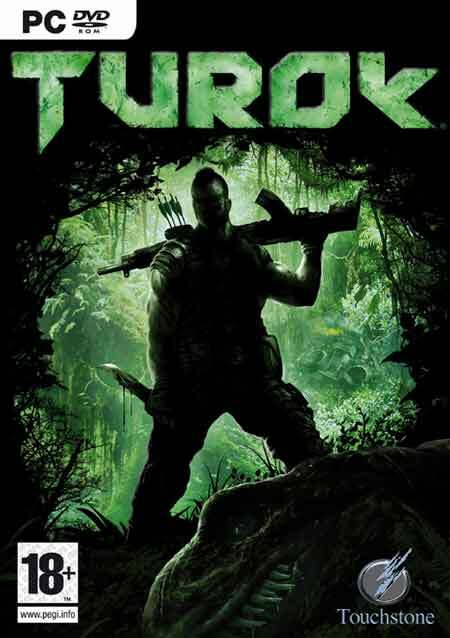 Turok follows the story of Joseph Turok, a member of the space marine squad Whiskey Company, on a mission to take down his former unit, Wolf Pack, and its leader Roland Kane. Wolf Pack has seized control of a planet undergoing terraforming, which has drastically increased the evolutionary rate of the planet’s organic life. As a result, all manner of massive prehistoric creatures walk the planet’s surface. As Whiskey Company’s ship nears the planet, it’s shot down, and Whiskey Company is marooned on the surface, struggling to survive against Kane’s mercenaries and the dinosaurs that roam the jungles. Despite the change in origins, Turok remains true to the sights and sound of the original series: dinosaurs and mutant creatures, giant futuristic factories and military bases juxtaposed against massive jungles, erupting volcanoes, and craggy wastelands. It certainly looks and feels like a prehistoric world, more so even than the previous games in the series. The setting is by far my favorite aspect of the game, and the graphics, while nothing mind-blowing, are still great looking and some of the animation work is fantastic. 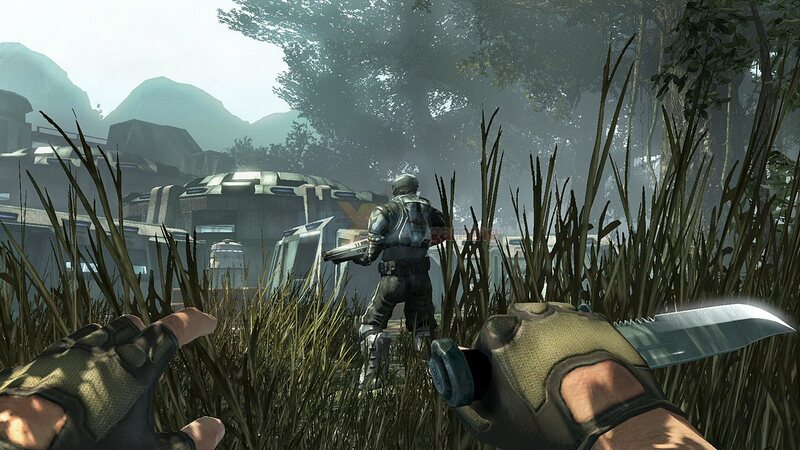 The art direction is great, and perfectly melds the familiar sights and sounds of a jungle with an alien atmosphere. Hoofing it across a valley, when suddenly a massive T-rex pops through the tree line t0 munch on some enemy soldiers is an awesome sight to see. The dinosaurs hunt eachother, as well as you and any other humans who happen to be nearby. It creates a surprisingly life-like setting, and makes you think twice about crawling through tall grass unwittingly. But roaming packs of raptors aren’t the only hunters hiding in the shadows. Turok puts a heavy emphasis on stealth. Early in the campaign, Turok finds his composite bow, the character’s signature weapon. Arrows are a silent and effective way of taking down unsuspecting enemies from a distance, and watching as a well place shot pins your enemy to a tree trunk is satisfying. Your other stealth weapon is the hunting knife. With the knife equipped, once you are close enough to an enemy an animation and button prompt will signal you to perform a knife kill. These are extremely brutal one-shot kills, and are the perfect way to kill both raptors and human alike. They make you feel like a total badass, and are fun to perform… until you’ve seen the same animations over and over again (no matter how gory-awesome they are). Unfortunately, these stealth mechanics are poorly implemented into the gameplay. There’s no indication of when you’re hidden or exposed, and enemy soldiers will spot you from seemingly secluded vantage points. The lack of radar or HUD notification of nearby enemies only exacerbates this issue, turning what should be the highlight of the gameplay into a frustrating ordeal, and making stealth playstyles completely impractical in some spots. But when it works, Turok really nails the feeling of being a hunter. 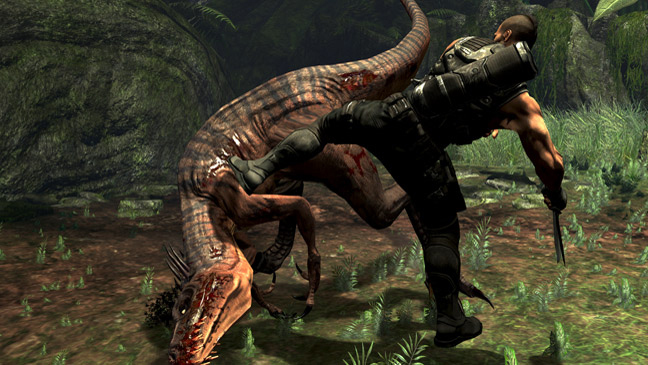 During the moments when stealth isn’t an option, Turok plays a lot like Halo, but with more dinosaurs and dumber AI. Humans just aren’t fun to fight in Turok, as they’re unfairly good at seeing you and possess perfect accuracy, yet don’t seem to notice when a grenade’s been thrown. Sure, Turok has its problems — spotty AI, long load times, generic space marine characters, and it definitely is a big departure from the source material — but its a fun game. I’ll pop it in once in a while to play when I need some fun, mindless enjoyment, or I want to run around stabbing dinos in the head for a bit. I’d recommend it as a rental or bargain buy, and to anyone looking for a fun 6-8 hour campaign. Pros: Fun, albeit generic FPS gameplay; great setting and art direction; kife kills are brutally awesome; when stealth works, it’s a blast; DINOSAURS! Cons: Poor AI; stealth is not always viable; horrendous load times; massive departure from original Turok comics/games. Closing Thoughts: I can’t help but get the feeling that Turok could have benefitted from either more time, or a bigger budget. I was really looking forward to the sequel of this reboot to see where the series would go next, but after Propaganda Games laid off over 70 employees a couple years back, the project was cancelled. That’s a shame, because Turok is too cool a franchise and too cool a character to suffer from being so criminally overlooked and undercooked. Next Just who is this Turok guy, anyway?